My ultimate cake is dense, moist and textural. It should cut without crumbling or sticking to the knife, it should not need cream to help it slip down, nor should it be so rich in flavour that I gain weight just thinking about eating a slice. Let me introduce you a cake that ticks all these boxes. Its one sin is that it tastes so good one slice is barely enough! Preheat the oven to 160C fan forced. Grease and paper line a 20cm round spring form cake pan. Cream the butter and sugar until light and fluffy, gradually beat in the eggs. Fold in the flour and the coconut in three batches. Spoon the batter into the cake tin, spread it to the edges and smooth the surface. Bake 30 – 40 minutes or until firm to the touch in the centre. 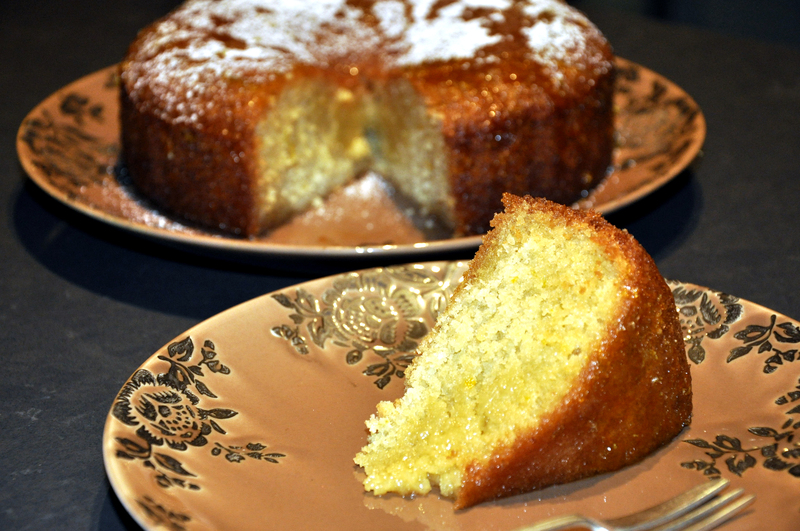 While the cake is in the oven, make the syrup by combining in a small saucepan the sugar, zest and juices of the fruit. Heat the pot, stirring continuously to dissolve the sugar. Bring to the boil, and cook 2-3 minutes. This entry was posted on May 26, 2012 by ladyredspecs in Baking, Cakes, Desserts, Food, Light dessert and tagged cake, coconut, lemon, lime, orange.